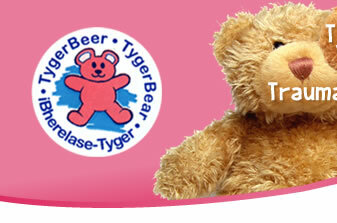 TygerBear receives a constant flow of requests to assist with debriefing and crises counselling at various incidents. We have the expertise and specialised knowledge, but we were hampered by the fact that we did not have a mobile unit which is immediately available and accessible to go the incident scenes. There is not currently such a service available in the Western Cape, as far as we have been able to establish in South Africa, where counsellors, specifically trained in the trauma counselling of children, can be called out. Even in incidents involving the traumatisation of adults, there are often children as family members and next of kin, who require counselling and debriefing. We are convinced that members of our community can benefit by this service – research has proven that immediate handling through counselling ‘n positive impact has on the long term when working though a trauma. In 2009 we looked forward to the building and development of the Mobile Trauma Unit, which would be accessible and adaptable to the needs and requirements of the various trauma situations. 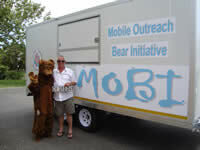 MOBI - Mobile Outearch Bear Initiative became a reality on the 3rd of December 2009 with the arrival of our first mobile unit, through the help and sponsorship of kind supporters such as the Tygerberg Rotary Club and Mrs Estelle Fillies. 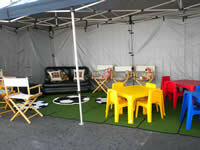 Experience has taught us that the risks to our children during events, such as mentioned above, is intensified. Therefore we emphasize the importance of trained child minders as well as professional trauma counsellors / therapists available for onsite management of any situation or need pertaining to our children. The challenge which have been identified in several incidents is the need for an entire team to be onsite and available for the duration of the situation. 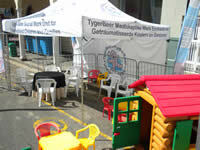 This Unit will also be of tremendous importance with the upcoming 2010 and the risk involved for our children and families joining in festivities at the Fun Parks. Through the development of this mobile unit , the message that South Africa cares and protects our most vulnerable members of society. Our Mobile Unit departed on her "Maiden Voyage"on the 4th of December to Long Street for the FIFA Soccer Draw and launch of the Fan Parks. 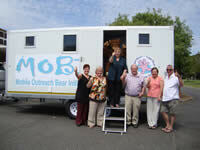 The MOBI Team assisted with onsite counselling, facilitating a "Lost and Found" service for children and creating a child friendly environment. 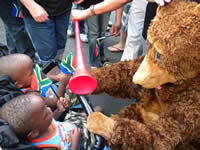 With more than 55 000 people in a confined area for the "Big Draw" it was of the utmost importance for TygerBear to lend a helping hand and ensure the safety and security of our children.